Warmer weather means lighter clothing all around, and footwear is no exception. But before you grab the flip-flops for summer outings and activities, physical therapists join other medical professionals in offering a word of caution: long-term flip-flop use can be bad for the feet, as well as other parts of your body. Why? Because not only do flip-flops offer little protection or support for your feet, but they also alter the way you walk – and not for the better. According to Shroyer’s research, which was reported in the American College of Sports Medicine, flip-flips change a person’s gait by forcing wearers to scrunch their toes up as they walk in order to hold on the footwear. 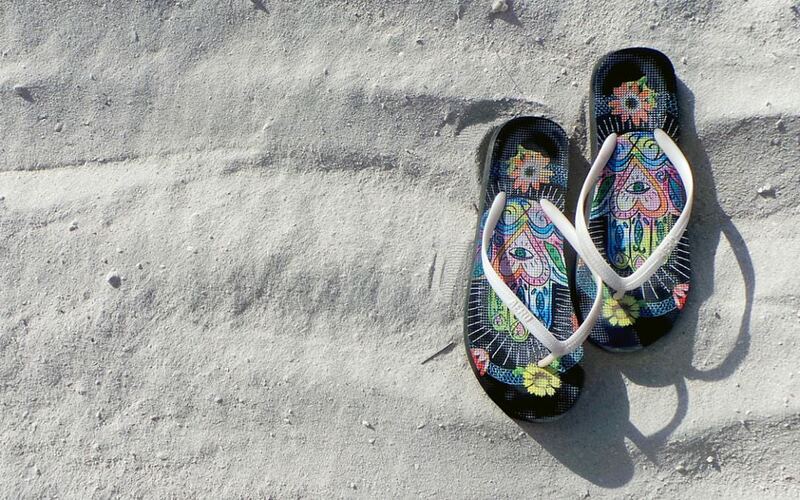 In turn, flip-flops lead people to take shorter strides that turned wearers’ ankles inward, which can lead to plantar fasciitis and ankle pain. This, along with the chain-reaction affect up into a person’s musculoskeletal system, is relevant to everyone. It’s especially relevant, however, to those who are already predisposed to knee, hip and/or lower-back pain. Don’t live in your flip-flops. In other words, flip-flops have a time and a place – in the shower, on the beach, the backyard, etc. But don’t wear your flip-flops during long walks, workouts, stop-and-go activities, or revert to them as your be-all summer footwear. Listen to your body. Even if you’re being smart about your flip-flop use, continue to listen to your body. Discomfort or pain in your foot, ankles, knees, hips, and/or back can indicate that your gait and stance requires better support at its foundation: your feet. Be prepared with alternative summer footwear. Complement your flip-flop wear with sandals that provide additional foot support and a strap across the back of the foot to better hold them on. Or, consider hybrid sneaker sandals if you plan to be more active. If you do find that you experience foot pain or ailments (which may be related to improper footwear) that makes walking, jogging or movement more difficult this summer, a licensed physical therapist can perform a thorough gait analysis and pain evaluation. Such efforts go far toward helping ensure the body’s foundation is always protected through the use of proper footwear. I was just thinking this very thought as my new flip flops for the season arrived. I love flip flops; but recognize their limitations and will wear my beloved flip flops with caution.